The advantage of doing each under and over weaving move separately is you have complete freedom about the texture and colour of patterns you make. But it’s very slow as each over and under is done by hand. Explains why tapestries and tufted rugs take a long time to make and are very expensive. Next step – big advance in technology – devise a way of holding the warp threads so the weft thread can go all the way across in one pass. This is ‘plain’ weave, often called ‘tabby’. To make this simple weave, you need a way to hold alternate warp threads up, so there’s a gap between them and the others. Then you can pass the weft through the gap between them. The devices holding the warp threads are called ‘heddles’ (the drawing shows a ‘rigid heddle’, there are other types). Then you need a way of swopping the warp threads round, so that the ones which were up are now down, and vice versa. And you need a way of supporting the weft yarn so it’s easy to ‘throw’ it through the shed. That’s done by winding the weft yarn onto a shuttle. This post is about the simplest methods of holding warp threads. 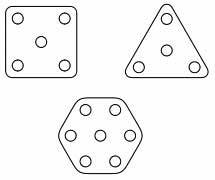 Again it’s possible to use simple methods to make complex patterns. But it’s still a relatively slow process. For “better“ ways of speeding up see the final paragraph. Better in the sense of quicker to make cloth, but it may be more difficult to make complex patterns. I’ve picked out a few videos and books on these simple looms. You can find a huge amount of information and advice on-line, and people who supply all sorts of gizmos and yarns. Shed stick, yarn heddle, heddle stick/ harness. Set up your frame loom with warp threads. Cut a ‘shed stick’ from cardboard, longer than the width of the warp threads, and 1 to 1-1/2 inches (3 – 4 cm) wide. Thread this over and under the warp threads. Turn it on it’s edge, and you have made a ‘shed’ gap which you can pass a shuttle of weft yarn through. Ah, but how to get back the other way, when you need the other warps raised to make the ‘shed’ the other way round. Well, before starting the weaving, lay the shed stick flat. Cut lengths of yarn, about 10 inch/ 25 cm. Tie one of these leash or ‘heddle’ strands round each of the warp threads not lifted by the shed stick. 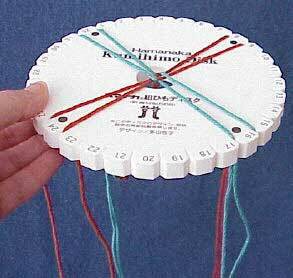 Loop the string heddles round a ‘heddle stick’, also called a ‘harness’. To weave, turn the shed stick on edge to make the shed, and pass the shuttle through. Then lay the shed stick flat, and use the heddle stick to pull up the other warp threads, so you can pass the weft thread under them in the other direction. These diagrams come from an excellent article with all the details. Another way of working is to have yarn heddles on all the warp yarns (no shed stick). Then you can lift up the warp threads individually or in groups, whichever you like. In this video the weaver uses sticks to pick up the warps she wants to use. Then when all the heddles are made, she ties them together into 3 groups, for the 3 different lines of the weaving pattern. When you have a separate heddle on each warp strand and use them individually, things can get quite complex and ingenious ! Those looms set up the warp threads on a frame, which limits the size of the area you can weave. How to get longer warps ? – tie one end round your waist and the other round your toes. – tie one end round your waist and the other round a tree. This is the next big step in weaving technology. There are many varieties of this sort of loom, thought up by different cultures. Have a good search if you’re interested. There are DVDs on ethnic weaving methods, general surveys and individual studies. And ‘The Book of Looms’, which is about weaving traditions around the World. 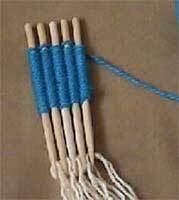 If you’d like to try one of these, here’s an excellent source on making and using a backstrap loom. Excellent examples of the complex patterns you can make when you control individual heddles, slow but effective. Those looms are very portable. But I’m just going to talk about looms that are not attached to the weaver ! On an Inkle loom, the warps are wound round a frame, which sets the length of warp. Inkle looms make 2 or 4 inch (5 or 10 cm) width strips, so they’re good for making flat braid with a firm weave. Here’s a good video showing how to use this sort of loom. Yarn heddles (lightest colour in the photo) hold alternate warp threads in a fixed position, and the other warp threads are moved above or below them by hand. sadly site on 75 things to do with braids no longer (2018) exists. Inkle looms can basically only make the simplest plain weave. But there are ways of leading the warp yarns through holes in cards. The ways the cards are threaded, and then how the cards are turned during weaving, make different weave patterns. I can see why people find this fascinating, but I don’t think I would find it restful to do ! No doubt it gets easier with practice. 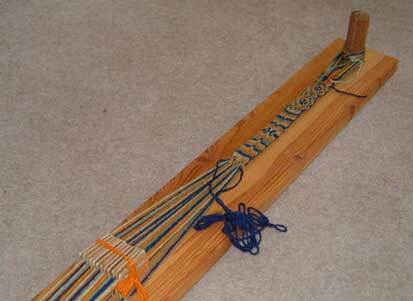 This loom is 2 yards (1.8 m) long – no problems with warping up ! Using cards on an inkle loom is called tablet weaving. No shortage of fun ways of weaving without making an investment in the complex mechanisms of a big loom. P.S. here’s a very basic ‘loom’ for card weaving. And here’s a simple piece on a backstrap loom. Note in 2013 : I was going to write a final piece in this group, about rigid heddle weaving and floor looms. But it isn’t necessary – there’s no shortage of internet advice on them. They’re both ‘beam’ looms, a technical advance which allows you to make a long length of cloth (the warps are wound onto the beam). The difference between the two is in the heddles. 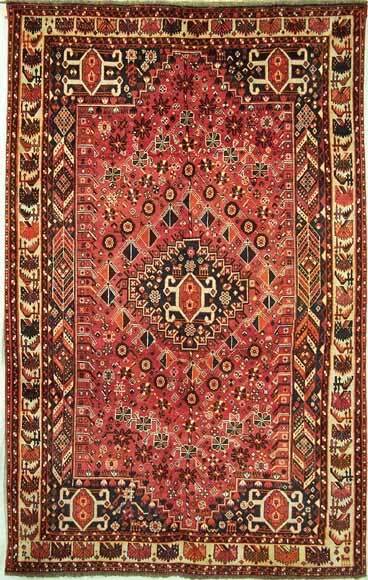 Many weaving sources which claim to be complete actually only mention floor looms. A ‘rigid heddle’ moves all alternate warp threads together. Weaving with one of these is often dismissed as not ‘real weaving’. But it’s a good type of weaving to have as a hobby. A fun way of learning the basics. Interesting in its own right as you can make (slowly) many textures. You can weave wide enough fabric to use for making clothes, though rigid heddle looms big enough for that are quite large. Floor looms have another technical advance – each warp is in an individual heddle, which is held in a frame called a ‘shaft’. Any floor loom is quite large (I knew someone who had one made from tree trunks – you need a barn for those). But there are smaller looms called ‘table looms’ which use the same shaft mechanism. The heddles are threaded in groups – each group in its own shaft. An easy way of making some though not all textures/patterns. The more shafts the loom has, the more textures you can make. And the more difficult it is to learn. Another advance which has high pay-offs in the ease of doing some things, but other things become impossible (compared, say, with a backstrap loom). Unless you have a computer-controlled loom which can alter individual heddles. There are introductory video classes on both these loom types at Craftsy. The simplest loom holds the lengthwise warp threads on a ‘frame’. All frame loom weaving methods have the same basis. For many people the first step is to make the frame ! Set up the warp threads on the frame. Then weave the weft thread or fabric strip under and over individual warp threads by hand or using a needle/ bodkin. Or tie tufts of yarn onto the warp threads. 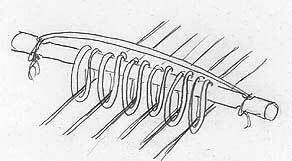 ‘Beat’ or press the weft threads together by fingers, fork, comb or a similar tool called a ‘beater’. The frame for the warp threads can be a rectangle of sticks, or slots cut in the edge of cardboard (not the same as ‘card weaving’, see next weaving post !). Do an internet search for tapestry looms, cardboard looms, lap looms to get multiple suggestions on how to make frames (sticks from the garden, old picture frames, cardboard boxes. . .). You can buy frames as well ! The simplest tapestry/ rug type weaving has warp strands about 1/8 to 1/4 inch apart if you’re using a needle to weave with, 1/2 inch or more if you’re using your fingers to weave. Creative Bug has a YouTube series about making and using frame looms. Here’s a summary of the ways frame looms are used. As before, I’ve given mainly links to videos, not many pictures. You can wind strips of fabric under and over the warps, to make rag rugs. There’s an excellent series of videos from Expert Village on the steps of rag rug making. 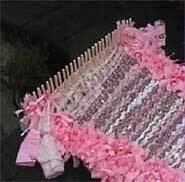 Rag rug weaving can be a good way of using up fabric scraps. You need tough warps to stand up to being walked on, and you can buy linen and jute yarns for this. You can use similar methods to make less coarse weaves. For example, weave yarn over and under more closely spaced warp threads, probably with a needle or bodkin. When you do this, you can go over and under different numbers of warp threads, to make all sorts of interesting textural weave patterns. On a smaller scale, making small items on cardboard looms has the advantage that you’re not restricted to making things with square corners. You can even buy cardboard looms which are not four-sided. ‘Weaving without a loom’ by Veronica Burningham has some ingenious projects such as making a beret, or both sides of a bag at the same time. As well as projects which can be woven using just household items. You can have a lot of fun with a piece of cardboard, a darning needle, a ball of string, and some ends of unused knitting yarn. Make coloured patterns, and explore different weave textures to understand fully how they’re made. But there’s also the potential to make major pieces of art and craft. You can make woven patterns by using different colours or different texture yarns. You can also make different weave textures, by having the weft yarn passing over or under more than one warp yarn. Easy to try this out on a frame loom, as you control all the under-and-over moves. But this is more explored by people with increasingly complex looms (third weaving post). Once you start going into this you can find much information online, such as this amazing archive of weaving patterns. There are several books on weave patterns. And computer software to help with working out how to make them. 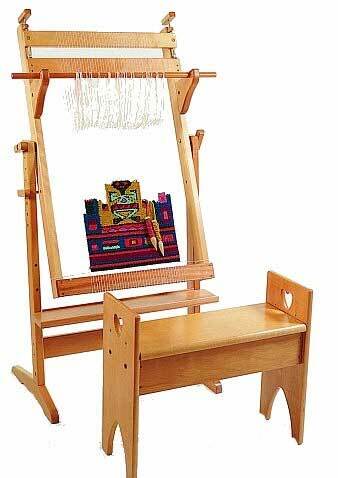 This sort of ‘loom’ is also used as the frame for making many types of tufted rugs. There are different ways around the world of knotting lengths of yarn onto warp threads on a frame. There’s much information on the web (from casual to scholarly) about knot types, and the patterns typical of different areas of the world. As a starting point, here are some short videos from the Victoria & Albert museum. There are also several DVDs. So, with these very simple methods where the weaver makes each individual under and over move or knot separately, you have great freedom about what you can do, everything from simple to complex in the placement of colour and texture. These methods of weaving on a simple frame can go from children’s play through homely conveniences to high art. But these ‘one stitch at a time’ methods are very slow. Most looms are tools for speeding things up a bit. Though what they gain in speed, they loose in flexibility. These faster looms are in my next weaving post. Someone on a sewing board recently described her enjoyment of weaving. Though I love sewing, for peaceful relaxation I need a repetitive activity that can be done without much thought. As I’ve had to give up knitting for manual dexterity reasons, I wondered if weaving would be restful and productive. But when I tried to find out about weaving from the internet, it all seemed very confused. Many different types of weaving, many different types of loom. No clear descriptions anywhere of all the different sorts. Often the only surveys on the internet are in very intellectual language with no pictures and no explanation of technical terms. Even the retailers expect you to know what you want (both looms and yarns) and what the words mean. Of course there may be books which do what I’m looking for, but I haven’t got easy access to them. There certainly are books which claim to be bibles of the topic but which actually only cover one type of loom. Lots of books and DVDs available (for one specialist list see books and DVDs). The great internet resource is that weavers are generous on YouTube. Many little videos about different weaving processes. So here is what I’ve been able to make of it. From my earliest notes, it’s obvious I started out very confused ! so I hope this is not positively misleading. . . I haven’t included many pictures. I have linked to videos, as it’s much easier to understand when you see the processes in action. Once you know some of the words, and start searching, it’s easy to find out a lot more. – weaving on a simple frame. – speeding up : beyond the Frame Loom. Basically a way of interleaving strands to make a surface. If the strands are stiff enough to be self supporting, then you can do basket weaving and make mats – not what I’m going to talk about. If the strands are floppy, then they need to be supported in some way while they’re being interwoven. Hence all the looms, pegs, pins and other weaving tools. Woven – interwoven strands at right angles. Knits – interwoven rows of loops. There’s also bobbin lace, crochet, tatting etc. which I’m not going to go into. The most basic method is just to use your fingers. Here’s a video about finger knitting. 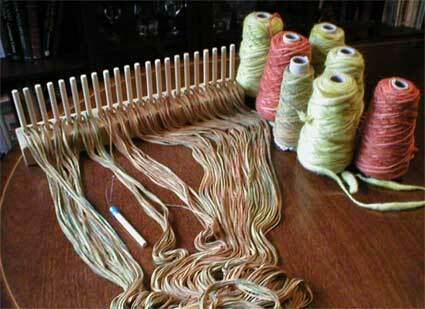 This is sometimes called finger weaving – though there’s something else called that, see later ! Stands up surprising well to being done very badly 😀 though you do need to do 4 or 5 ‘rows’ before the result makes any sense. It’s a similar process when you use pegs on a stand instead of your fingers. As a child I used to do ‘French knitting’ over 4 nails hammered into a wooden cotton reel. Now you can buy looms for doing this. This is usually what you get if you buy a child’s toy said to be a loom. Here is a video about the basics, and here a video which shows how to produce a variety of stitch types. For making wider knit fabric with smaller stitches, you need a knitting machine, which has a row of hooks instead of pegs. This may be called a loom. Basically setting up and finishing off on a knitting machine are a bit fiddley, but making an area of fabric is very quick. Here is a video about basics. Similar price to a mid-range sewing machine. I tried some machine knitting a long time ago, but as I was an enthusiastic and fast hand knitter at the time, it didn’t have much appeal. Perhaps I should get the machine out and try again. But machine knitting is another direction I’m not going to go into here ! A japanese method of weaving multiple strands into a braid, using a template sometimes called a loom. Here’s a clear video of the process. Using one of the original smooth circular wooden tools needs skill. Using a foam device as in the photo and video, with slits round the edge, it’s much easier to make an even braid. That shape is for solid braid. There are also square discs for flat braids. Many different braiding patterns, with different numbers of strands. Several books. This looks like a lovely restful thing to do, but I’m not sure I would find much use for solid braid. Bag handles, belts, jewellery. Originally used for holding samurai armour together. Possibly the flat braids could be used to trim clothes. If you really get into this, you can use quality silken strands or narrow ribbons and include beads, to make braids of great beauty. So, now we get to ‘woven’ fabrics. Warp (long sound) – the lengthwise threads. Weft (short sound) – the thread that winds under and over, to and fro across the warp. There is a way of weaving without supporting any of these threads. But really the development of weaving is the story of finding ways of supporting floppy yarns so it’s easy to interweave them to make fabric. There’s one way (that I’ve found) of supporting the crossways weft threads, while the warp threads lie loose. Most looms are for supporting the lengthways warp threads while the weft threads are woven to and fro between them. Basically, this is doing the whole weaving process with some strands hanging free or lying loosely on a surface. 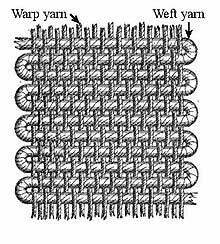 Warp and weft strands are not clearly different. Here’s a good video. Ingenious. This is a North American tradition, and there are several books. But with my shaky hands, it’s not a calm and restful thing for me to do. . .
I’ve only found one method of weaving which supports the weft, the strand that’s woven to and fro. Basically, the warp threads are attached to the ends of the sticks. Then you wind the weft thread in and out of the sticks, and push the windings down onto the warp strands. This is fun to do. Basically a way of making flat braid. So the results can be used in the same ways – belts, bag handles, hair bands, bracelets, sewn together into scarves, bags, soft hats. . . I think the result is a bit heavy and bulky to use as trim on clothes, except perhaps for outerwear. Also it doesn’t bend into flat curves well, so can’t be used to trim round a curved neckline for example. For a wider fabric there’s a peg loom. Used like weaving sticks, but the sticks are held in a stand, so you haven’t got to hold 20 sticks in your hand at the same time. 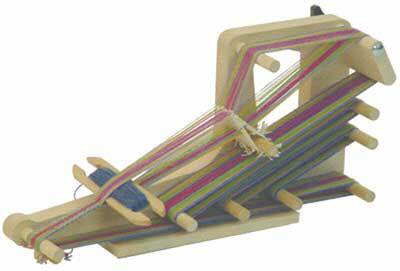 Here’s a peg loom with the warp yarns set up. Here’ some weaving in progress, weaving with fabric strips rather than yarn. Several books on peg loom weaving, and on rag rug making by this method. Also good for bags and cushion/ pillow covers. The vast majority of weaving methods have the tension on the warp threads. My second piece is planned on the simplest ‘frame looms’, for rag rugs, tapestry, and knotted rugs. Then what most people think of as looms. Meanwhile, I’ve got a simple ‘rigid heddle’ loom and am having adventures making a very wobbly scarf 😀 It isn’t anywhere near as easy as it looks – watching an expert doing it is a bit misleading ! definitely a craft skill involved. But this isn’t suddenly going to turn into a weaving blog 😀 I’m just recording what sense I’ve made of it all, in case anyone else is looking for what I wanted to know. . .
P.S. If you’re really peeved that I haven’t said anything about sewing or style, have a look at the Palmer-Pletsch newsletters for their ideas on which patterns are best for which body shapes.